This section of the Snoqualmie is a great teaching run. 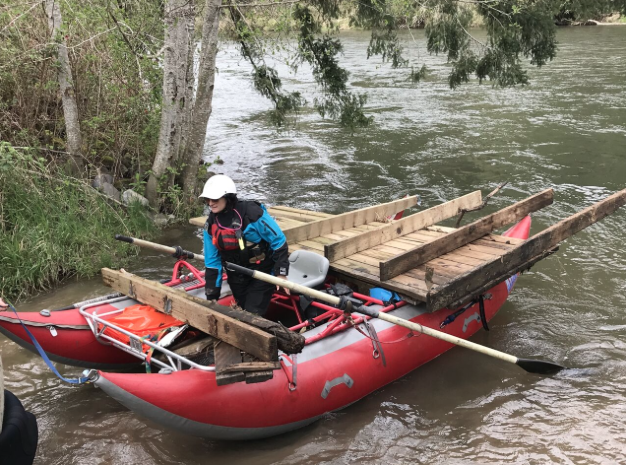 While we did it at a low water level of 418 cfs, a higher level would be even better for teaching. There was no shortage of things to do. The eddy hop game, ferrying, attainment and just plain wave trains are all good, even at this level. I can see, as the river gets more water, these games would become even better and more demanding. In August we drove to the East side of Utah to run down the Green River thru the Gates of Lodore. There was smoke in the air all the way across eastern Wa, Idaho and some in Utah as well. On the river we could see smoke in the air but down on the river it didn't seem unhealthy. 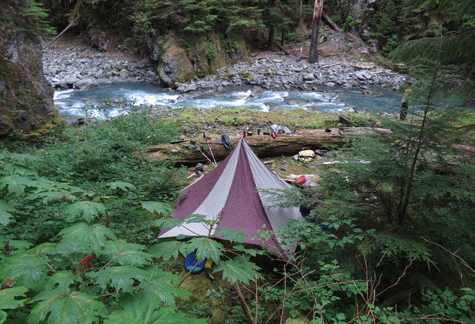 The river was very good to us with rapids and camps and adventures. Having heard the South Fork of the Salmon is fantastic whitewater, this river had been on my bucket list for a few years. Rated Class 4-5, it was more challenging than other multi-day trips I had done, and I wanted to go with someone who is familiar with the run. The opportunity suddenly came up. 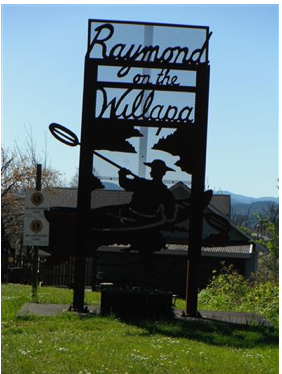 I wanted to thank you for your support of the Nisqually River Cleanup on Saturday, April 21, 2018 and give you a quick recap of this Event. 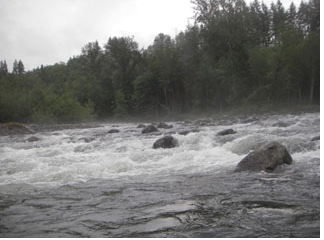 The river was at a great level, approximately 2180 cubic feet per second (cfs) at McKenna. The weather was fantastic, plenty of sunshine and no rain. More importantly, the volunteer turnout was great!AND 2,080 pounds of trash was collected! The Illinois River in Oregon had been on my bucket list for a few years. As this is a challenging Class 4 32-mile stretch, we were aiming for the optimal 1000-1500 CFS range and a nice warm weather. Bill Petty, Doug Nicholson, Bob Metzger and I chose April 20 as our launch date and headed to Grants Pass, OR the day before. Bill has run the river about 10 times, Doug has several times, Bob once about 20 years ago, and this was my first. The Olympic Peninsula is known for its rain, but whenever I go to the Humptulips Narrows (Class 3), it is sunny, and my fourth visit to this river on November 18, 2017 was no exception. Captain Bill Petty, Bob Metzger from Olympia, and I launched around 12:30 p.m. under the bright sun. This is our fearless leader Bill Petty’s 40th year of paddling. 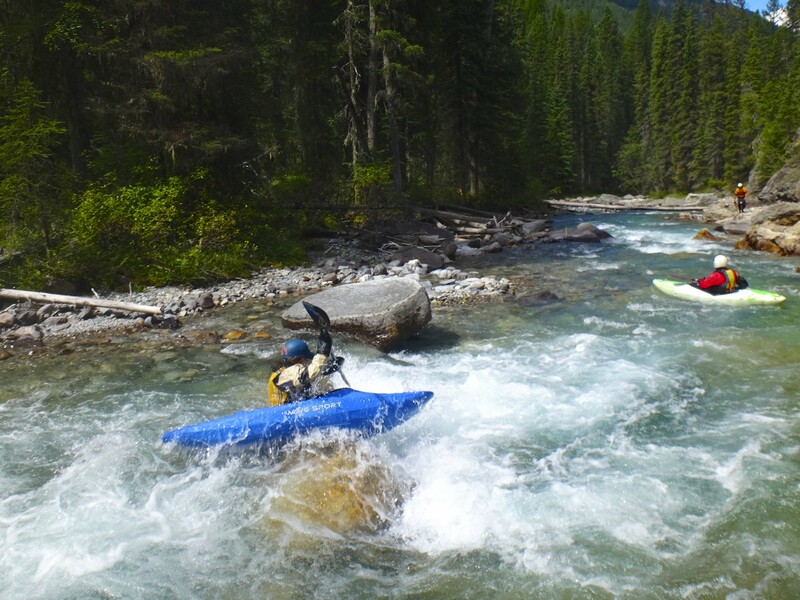 He has been leading annual whitewater road trips to British Columbia almost every year for the past 28 years, and BC continues offering endless rivers he has never run. To paddle unknown rivers again this year, the Team headed to the northern capital of Prince George this time. 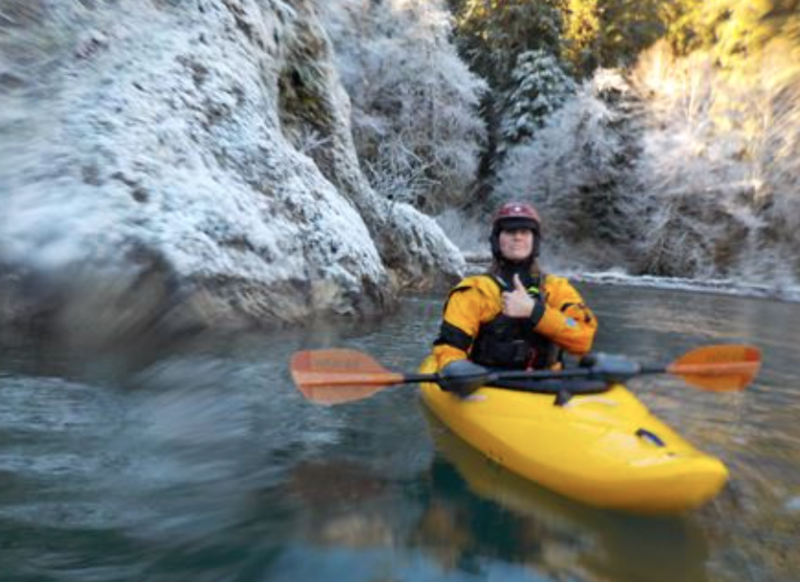 Shout-out to one of our lifetime members, Jon Almquist, who never stops volunteering his time to help others adventure and experience our beautiful rivers. 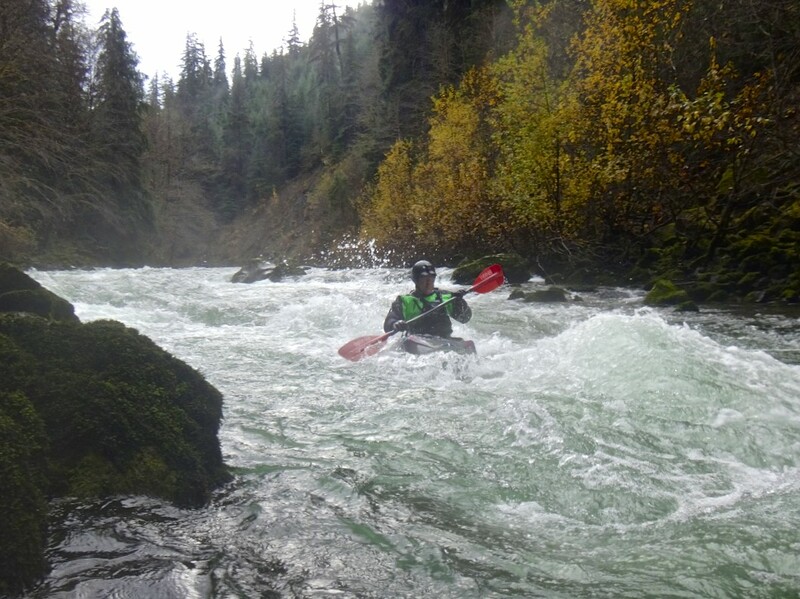 Whether it's helping out with the whitewater class, heading up skill builder trips right after class, leading adventure trips to the beautiful Olympic Peninsula or pushing any level paddler to their next level - he's always game! Thanks Jon for all your guidance! 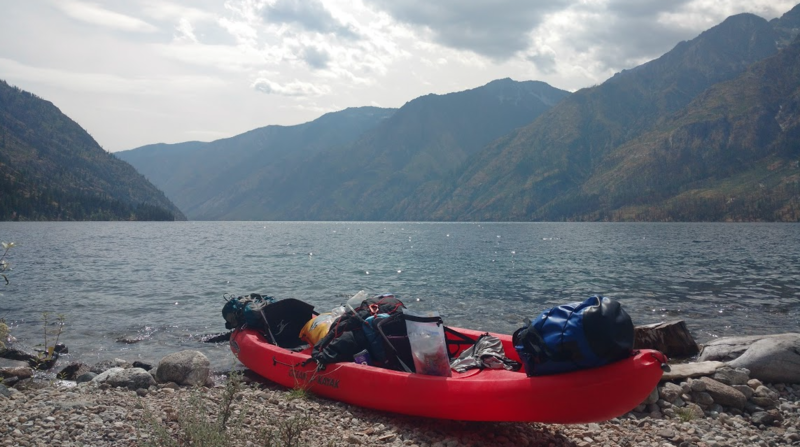 Rich and his wife recently completed a loop trip in the east and north Cascades - kayaking from Manson (near Chelan) to Stehekin, hiking through to Highway 20, and then cycling back to the start. Mileages were 46, 21, and 105 respectively, totaling 172 over 8 days. 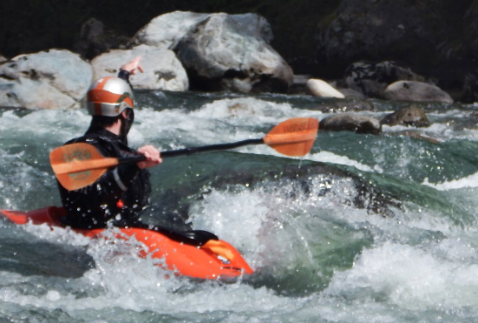 They enthusiastically recommend this trip if you like to combine multiple sports and get a good weather window (especially for the paddling portion). Beautiful scenery as you watch the landscape change from desert to mountains and back. 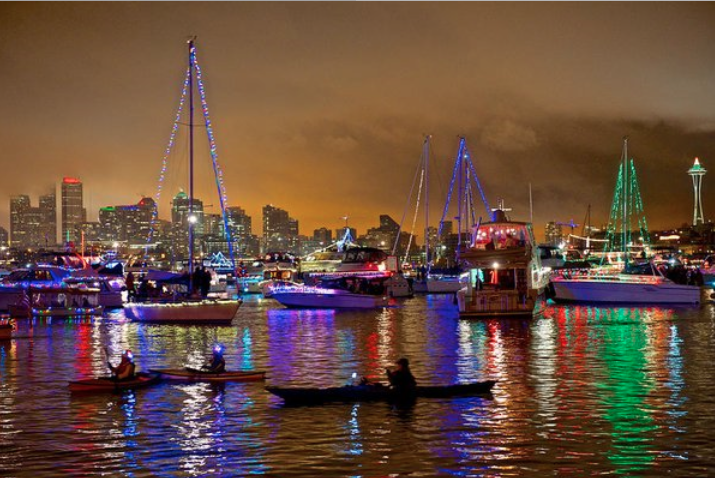 Twas the eve of the eve of Christmas in 2017, when the Argosy Cruises of Seattle, Washington were featuring their finale event, the 68th Annual Christmas Ship Festival, leaving Kirkland at 7 PM and arriving at Gas Works Park at 8:45 PM. The Argosy boats would embark from Kirkland, up north on Lake Washington, and then head west through the Montlake Cut, taking a half hour break in Portage Bay, before continuing onto Lake Union, the finale point with stopping at Gas Works Park, before heading back to Kirkland. The 2017 Memorial Day Weekend Solduc paddle, was a complete success. Sunshine and enough water to paddle! From Friday to Monday, there were 51 people paddling various watercraft: tandem canoes, solo canoes, hard shell whitewater kayaks, a double IK, a Packraft, a small R2 raft, and two Fishing cats. 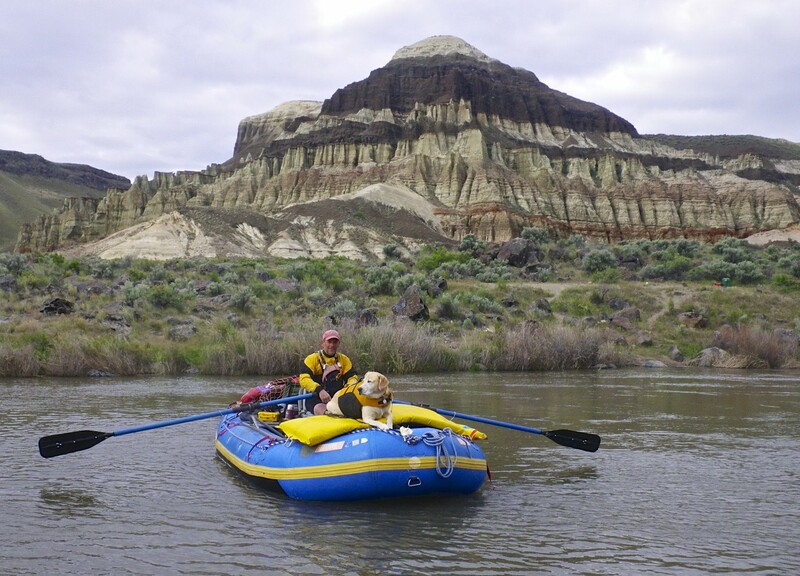 The largest group, all paddling the same river reach, was 38 on Saturday, paddling from Klahowya Campground to Hillstrom Road. Jennie, Bill, and I packed Jennie’s van “Morris” and left for the Vancouver Island on Thursday, April 13 to join the Vancouver Kayak Club’s annual trip to the island. Despite the holiday weekend (Easter Monday is a federal holiday in Canada), the 10:45 p.m. ferry was fairly empty. We checked in a hotel a little after 1 a.m., went to bed by 2 a.m. and got ready for the four-day weekend. After heavy mid-week rain, the Dungeness was higher than we liked on Friday, February 17, 2017. Changing plans, Bill, Doug, Pete, John T from Canada, and I ran the Park to Riverside section of the Sol Duc. John had to leave, but the rest of us camped there and drove back to the Dungeness on Saturday, February 18. Claire, Lora, and Josh from Poulsbo joined us at the Dungeness Hatchery. 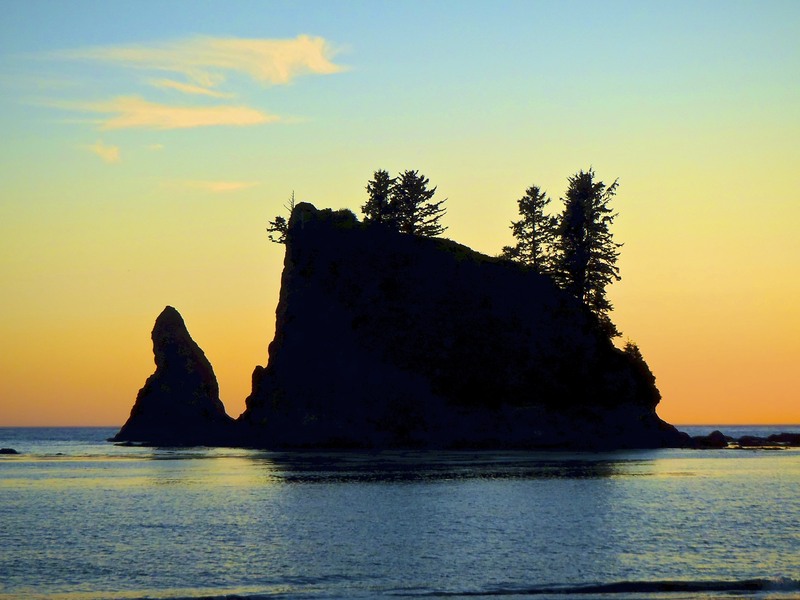 This fall/winter season, the Olympic Peninsula hasn’t been very cooperative. Jon Almquist’s Humptulips and SF Calawah trips had to relocate, as well as Team Petty’s Thanksgiving Humptulips trip. This trip wasn’t an exception. In mid-July of 2016, at the very end of the runnable water level, a group of friends and family floated the Yampa River for 6 days in sunshine. The Yampa is on the eastern edge of Utah, is free flowing, and joins the Green River to become the Green through Dinosaur National Park. The paving of the Middle Fork Snoqualmie road has added a new pleasure to our local outdoor access. The road that used to be ugly with potholes, is now a smooth paved slide glide upstream. A few different access points for put-ins are present, but there are few. Sunday January 22 was the training day this year for the WW class in March. We take folks from previous classes and others interested to work with them on dealing with students and simple retrieval and rescue skills. 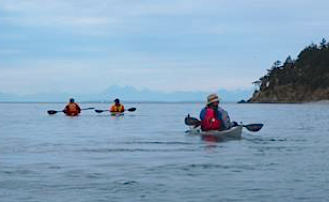 The group of seven students and three experienced instructors launched at Washington Park at 11:30 am on Thursday June 23rd with the goal of paddling across Rosario Strait to our first nights planned camp site located at Spencer Spit on Lopez Island. The strong currents and rips around Belle Rock Light and Bird Rocks challenged our plans. We had three swimmers, one lost Werner paddle and some new found rescue experiences for the group. Captain Bill Petty took the Team (Doug, Larry, Lora, and me) to his favorite destination, British Columbia. On August 4, Bill, Larry, and I hit the road and boated the Class 3 section of the Coquihalla. I had run it with more water in the spring of last year, but it felt much steeper this time, as all features were more exposed. I have tried for years to get on this river section, and always it fell thru, usually because the water level was wrong. The past two years it barely ran in the hundreds for the Spring season. This year saw snow pack in the mountains that provide the water, and we had a week of levels above 1200cfs. 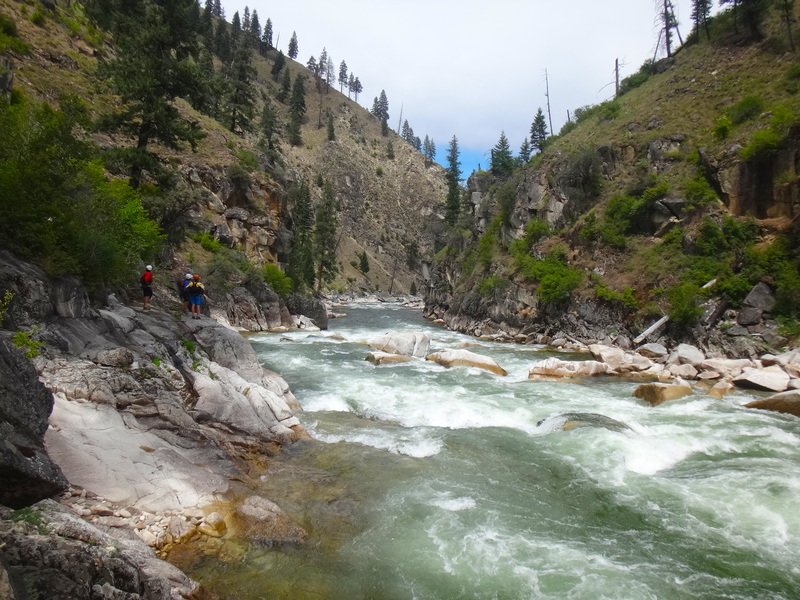 For the Memorial Day weekend, Captain Bill Petty led the Team to Idaho’s panhandle near Avery to run the St. Joe and nearby rivers. Bill, Doug, Ken and I got there on Thursday, May 26 and found a free campsite on the river, five miles above the Tin Can Campground. 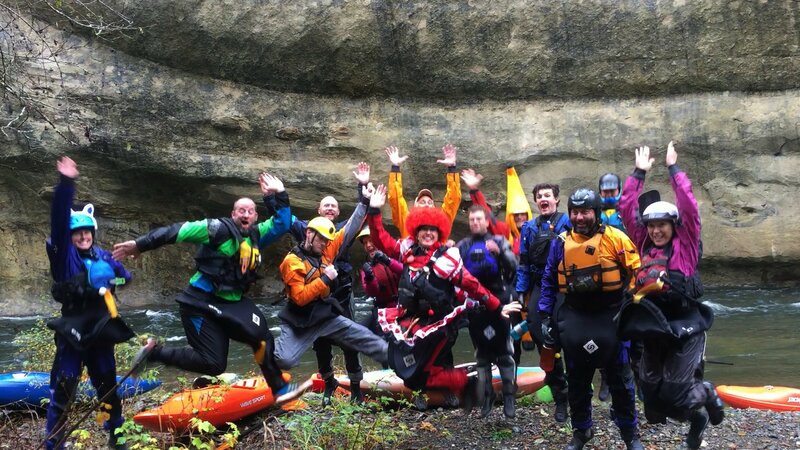 Annual Halloween Paddle on the beautiful Lower Green River Gorge (class III), what a fun day to celebrate! 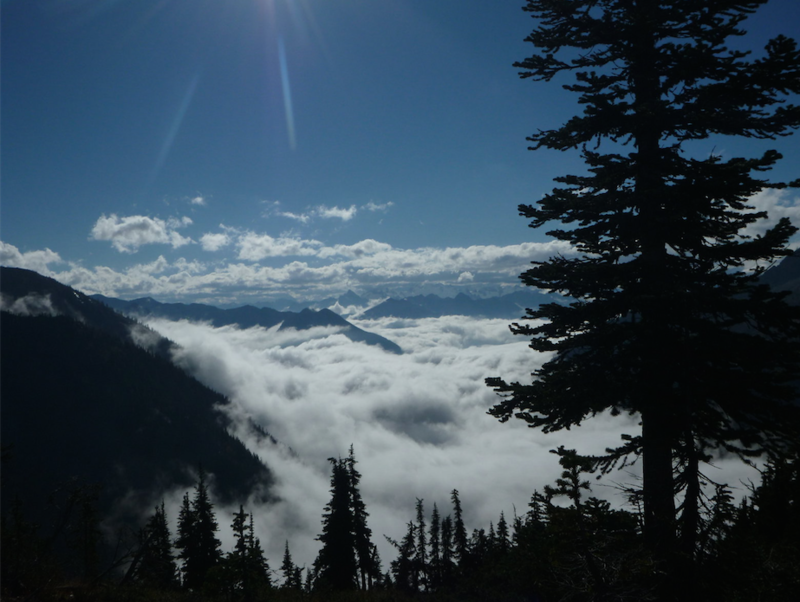 The Nisqually River is fed from the slopes of the Nisqually Glacier on Mt Rainier. 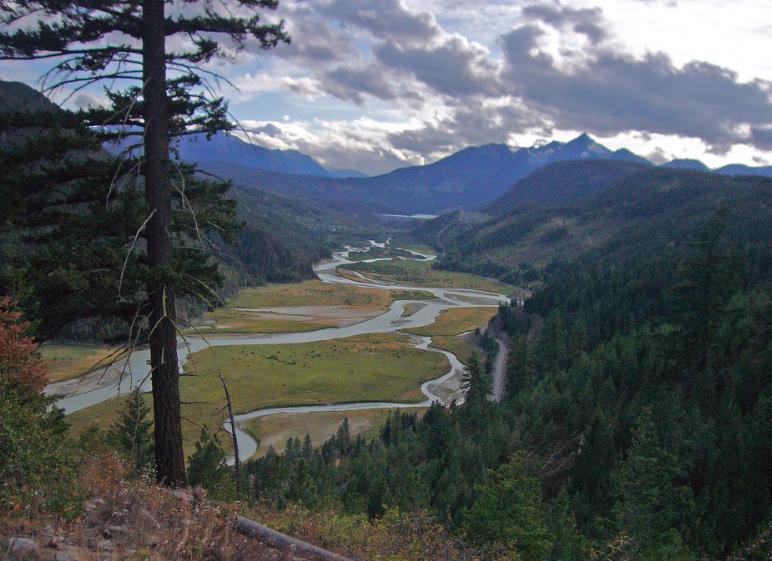 The river is regulated by the two dams upstream, the first being the Alder dam and the lower one being the La Grande dam, however, sometimes when there's too much water or not enough, the dams can control the flow allowing boating most of the year throughout this river reach. There are times I don’t like being a beginner at a sport and this was one of those times. The first time I remember feeling this way was when my kids talked me into giving up skiing and taking up snowboarding. Going back to falling when I got off the chair lift and having to stay on the bunny slopes is hard when you yearn to be up on the diamond runs on your skis. On March 19, the Vernal Equinox this year, I led my annual whale hunting trip out of Mukilteo On this occasion the famous grey whale Patch hunted us instead. Fifteen paddlers set out on a lovely calm day from the new park next to the Boeing pier in Mukilteo. I like to take a lot of paddlers because some are needed for whale bait. It works. We launch at 8:05 am on a beautiful 37degree morning under bright sunny skies from Young's Park on the north end of Guemes Island. Headed west then south paddling down Bellingham Channel towards the south end of Cypress Island. If you've never been to Index, a little town on the Skykomish River, you'll have to visit it next time you want or need to take a short road trip, put in for a WW adventure, go fishing for salmon and/or steelhead, spend the night in a haunted hotel, or just have lunch at a rustic cafe on the river run by Bill and Karen Corson. On Friday, February 12, 2016, Captain Bill Petty, Pete, Doug, and I headed to the Dosewallips. Our original plan of running the Hamma Hamma was postponed due to the high water combined with our unfamiliarity with the river. Because three of us had just run the Lower Dosewallips on last New Year’s Eve, we thought it wouldn’t be too bad. A Port Angeles boater Colin joined us at the take-out, Dosewallips State Park. 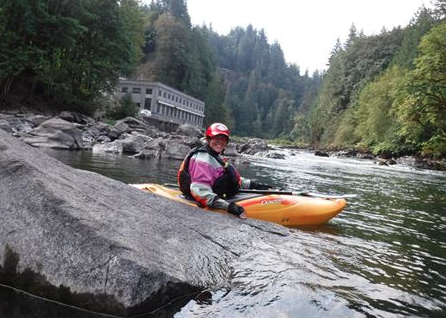 What a fun day at the pool, followed by a session on the Snoqualmie River Powerhouse section. The goal for the day was to train the helpers who have volunteered to assist with the 2016 WKC Whitewater Kayaking Course. 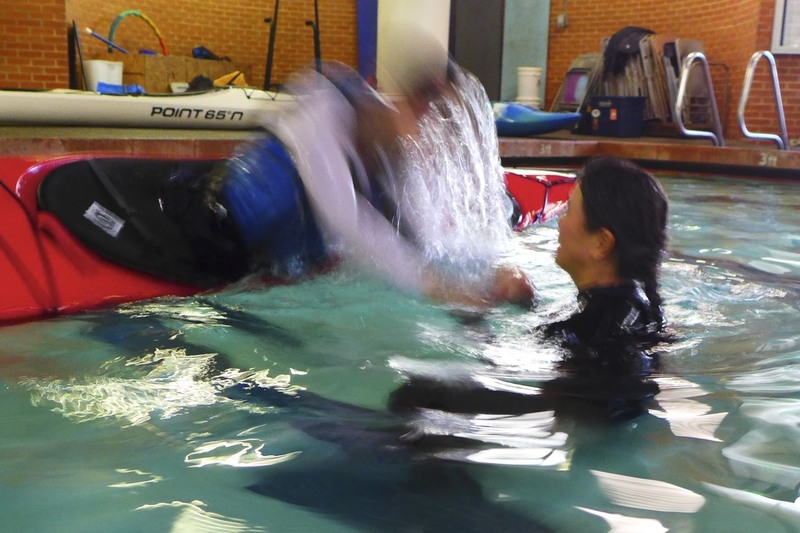 It also gave the instructors the opportunity to refresh our memories and try out new teaching techniques. 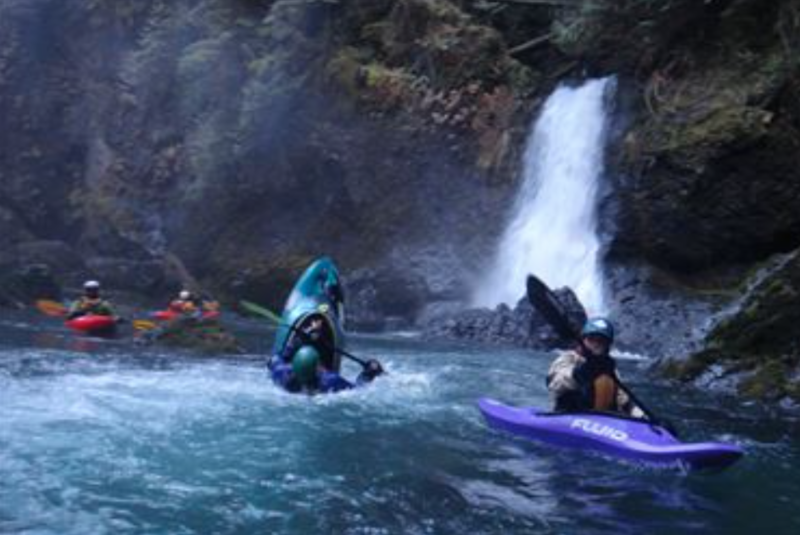 I had the best time bringing in the New Year in 2016 – I joined Bill Petty, Kanako, and crew for a class II/II+ adventure weekend on the north Olympic Peninsula. A perfect level of difficulty for me, since I haven’t really kayaked in over two years. 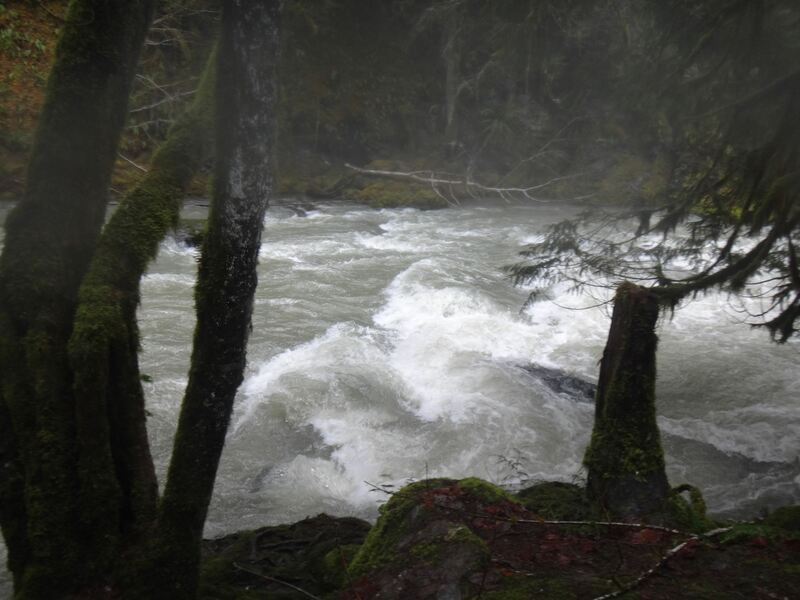 With its origin on the slopes of Mt Rainier, the river runs along the Fort Lewis Military Reservation and mature forests border both sides of the river. 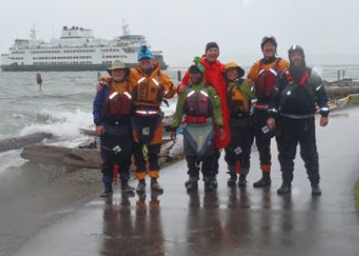 Captain Bill Petty led the team to the Southern Olympic Peninsula on his annual Thanksgiving weekend paddle. 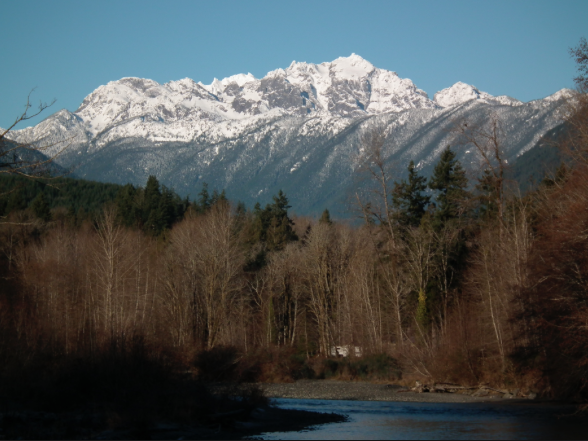 After running the Humptulips Narrows on Friday and the Middle Matheny Creek on Saturday, we ran the Lower Matheny Creek on Sunday, November 29, 2015. 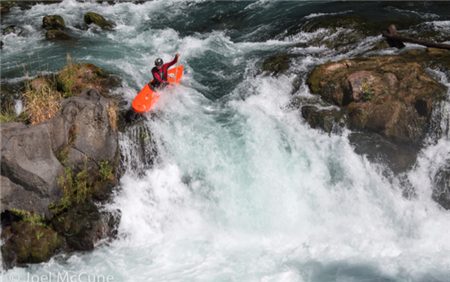 Whitewater Kayaking in the Olympic Peninsual at it's best! Matheny Creek bound for some adventurous kayakers ready to experience some amazing scenery and fun whitewater. Water-deprived in this area, Captain Bill Petty took the Team (Doug, Larry, Andy, and me) to Oregon in search of runnable rivers. Ironically, while we were away from October 29 to November 2, Western Washington had a huge amount of rain, and all rivers flooded. We, on the other hand, had mostly good weather, except raining when sleeping or driving. 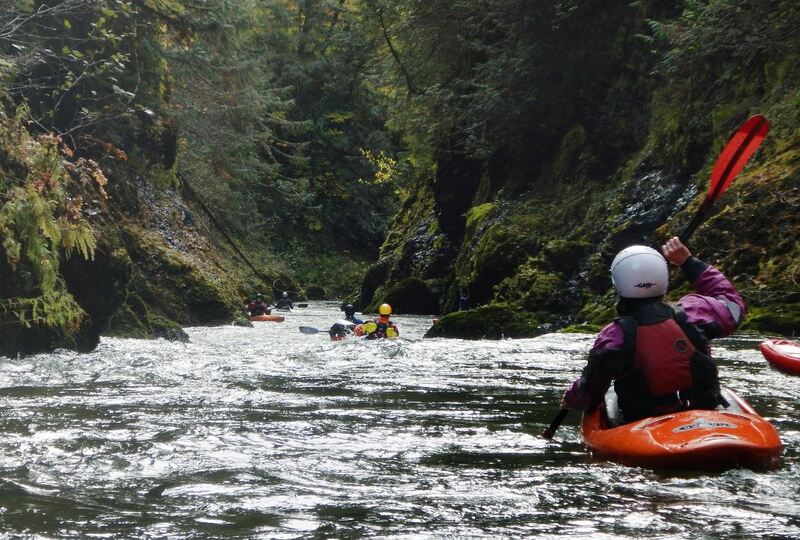 On Oct 10-11, a lucky number of us (13) enjoyed a fantastic weekend of paddling and camping on the southern Olympic Peninsula. With the Wynoochee gorge take-out access road gated by Green Diamond Resource Co., we were a little worried that our normal early-fall / low water favorite – the Wynoochee Gorge – wasn’t an option with the dry conditions we were experiencing. Stats: Tuesday, September 29, 2015, Class III+ - IV (V), Medium level flow, 16.5 miles, 9 hours from put-in to take-out, 5 kayakers, 6 swims, 1 broken paddle followed by a 30-minute struggle to assemble a 4-piece paddle, numerous scouting, a few portages including one over a high cliff, and an extremely difficult takeout climbing out the 100 feet sandy cliff. 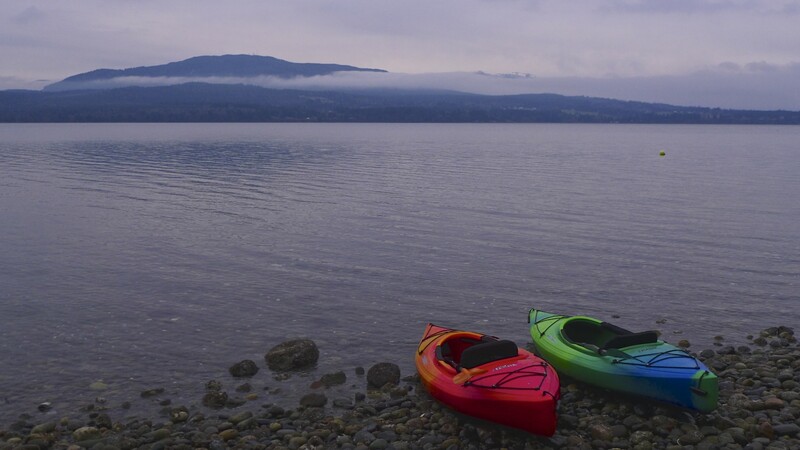 On May 16th 16 WKC paddlers set paddle around Lummi Island. For a special treat, Sterling Donaldson dropped off Five of his beautiful kayaks for us to try out that day. Many paddlers swapped boats to give multiple test drives. Such a long paddle is the perfect way to determine if a boat is right for you. 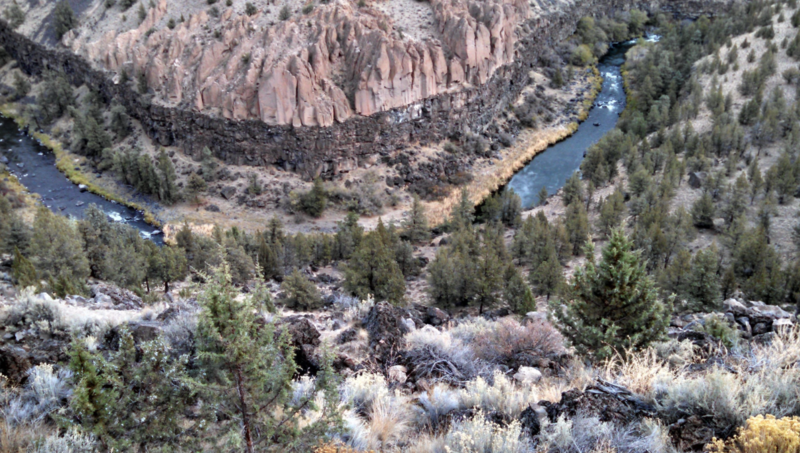 My favorite run in our area, of all the choices we have within a reasonable radius, is the lower Green River gorge. I have run it at many levels, from over 2k, down into the few hundreds. Some people like it large, maybe over 2k, but in the future we may not see levels like that very often. 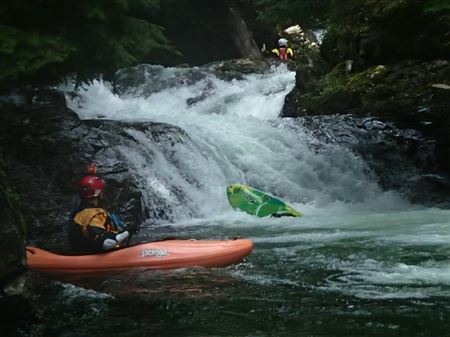 Whitewater Kayaking in the Olympic Peninsual at it's best! Matheny Creek Bound.. 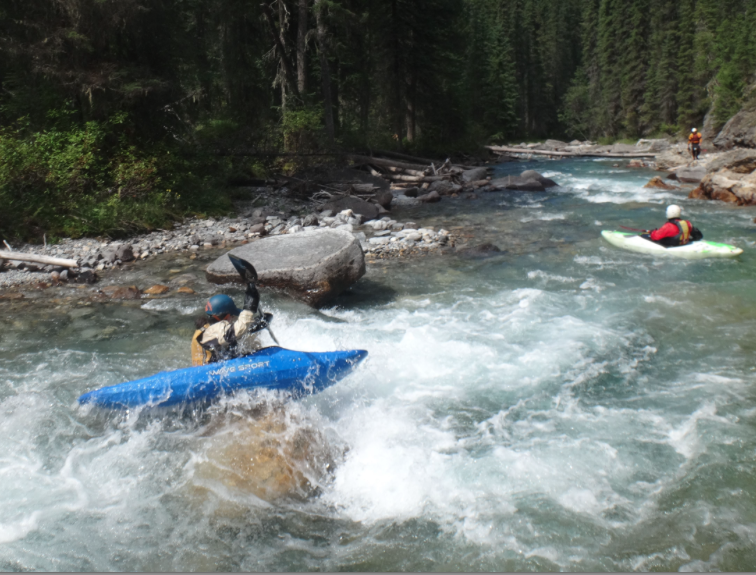 Mother Nature came through with some good rains which brought the Humptulips River into fine form… We had Water!! 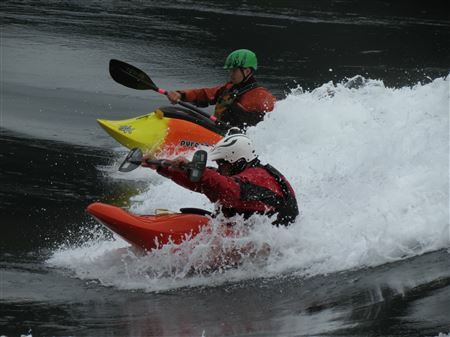 Fourteen paddlers attended the first Swiftwater Course of the season, taught by Casey Garland. The in-the-river portion of the class was taught at the Cedar River at Landsburg, and we spent lots of time in the water. 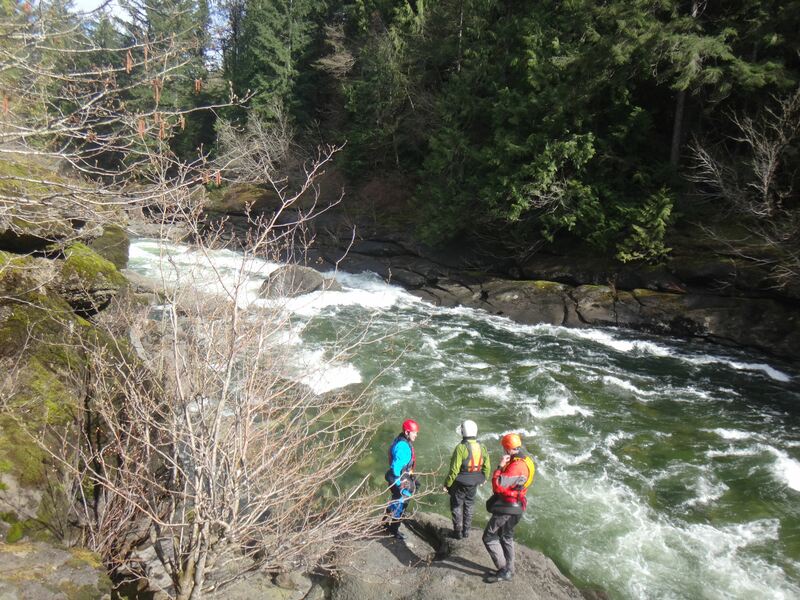 The Whitewater Basic Class was a great success again this year from 2/28 thru 3/21. Lots of learning, experience, and growth seemed to occur for all – students, instructors, and helpers alike. Ebb & Flow?! What is this jibber jabber? 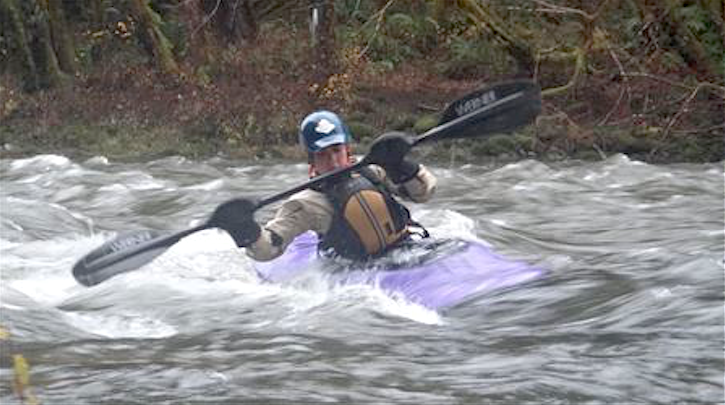 WELL, I now know more about the sea than I should ever have to know as a whitewater kayaker… ha! 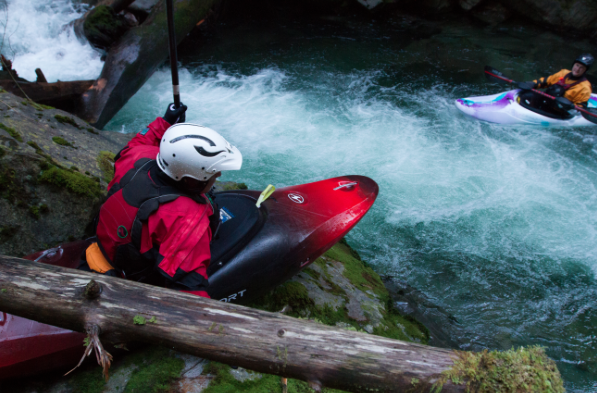 A crew of whitewater boaters ventured north to Canada to visit the infamous Skookumchuck Rapids, to find out what all the hoopla was about. 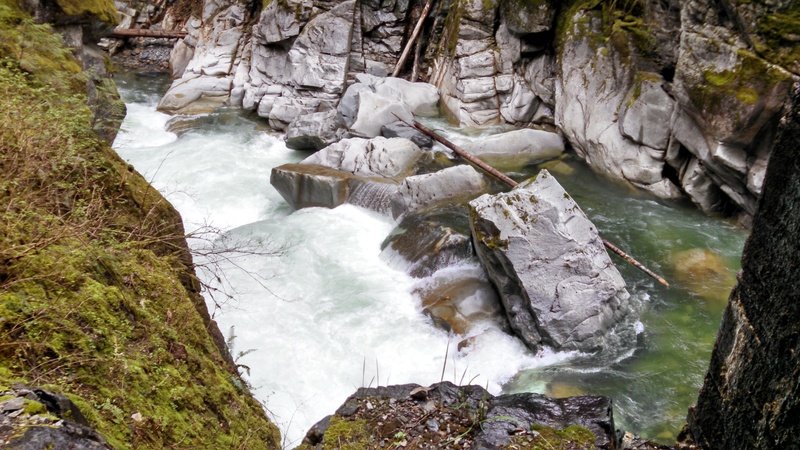 The skookumchuck Narrows is located on the Sunshine Coast of B.C. 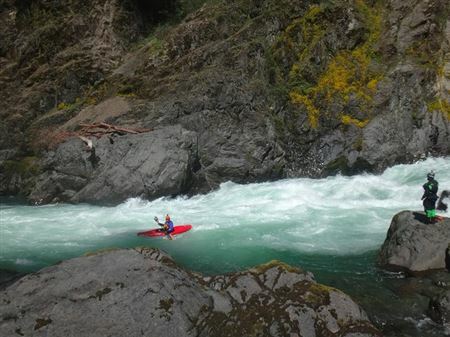 and takes about 6 hours..
A WKC fun-filled weekend on the White Salmon with a great crew! Thanks Ken Stallman for leading the annual club trip to Southwestern Washington. We usually try to hit the White.. 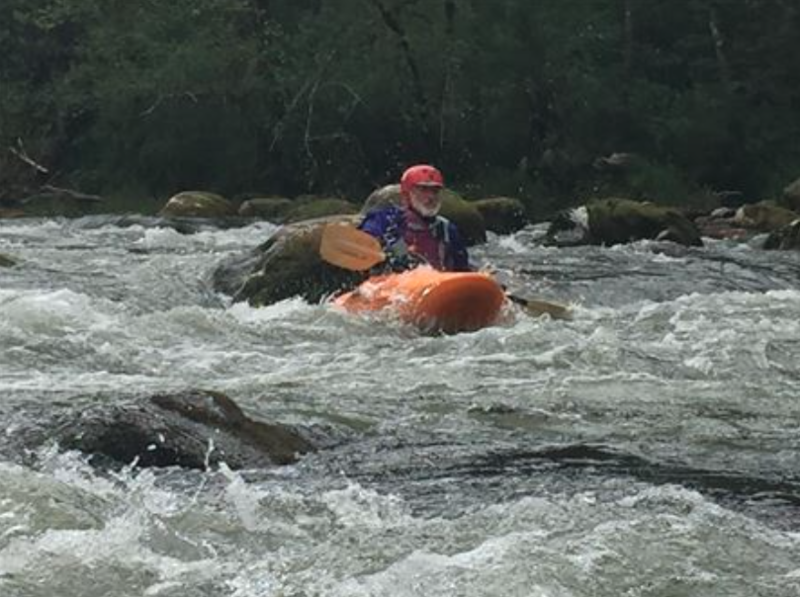 Led by Bill Petty, Doug Knapp, Jennie Goldberg, Andy Meyers, Chris Knorr and I paddled Statlu Creek (Class 3+) and Chehilis River (Class 3+) on Saturday and Coquihalla River (Class 3) on Sunday. 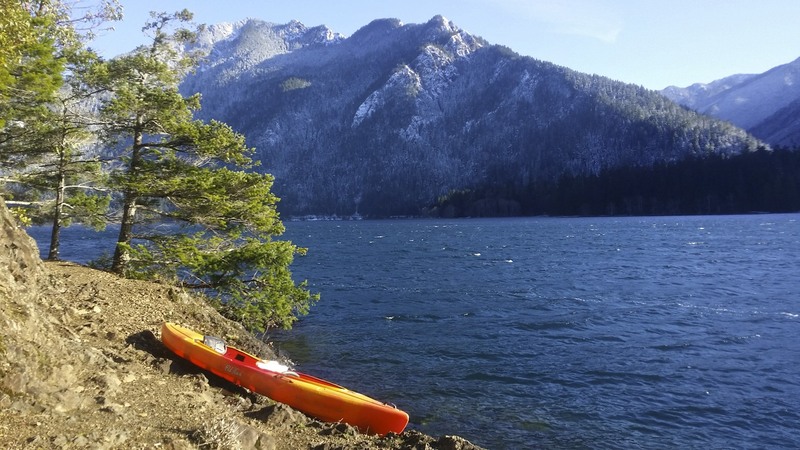 Nine paddlers met at Colonial Creek Campground on the morning of October 18, 2014 as the mist was lifting off of Thunder Arm in the North Cascades. We paddled north to Diablo Lake in smooth water and headed east up the channel to visit Horsetail Falls, past vine and bigleaf maples in their autumn colors. 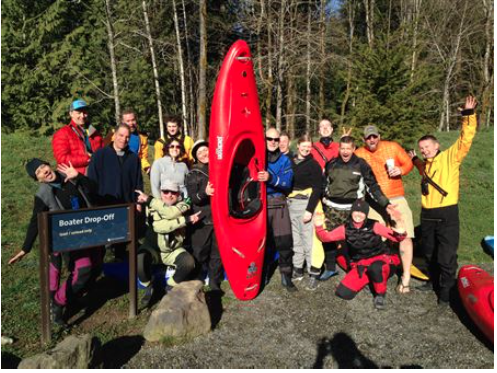 Seven WKC paddlers spent a beautiful day circumnavigating Guemes Island on Feb 22. The goal of the trip was to learn how to navigate San Jaun currents. This was a day with a southward strong ebb of 3.5 knots through Bellingham Channel, producing moderate eddies and rips to play around in. 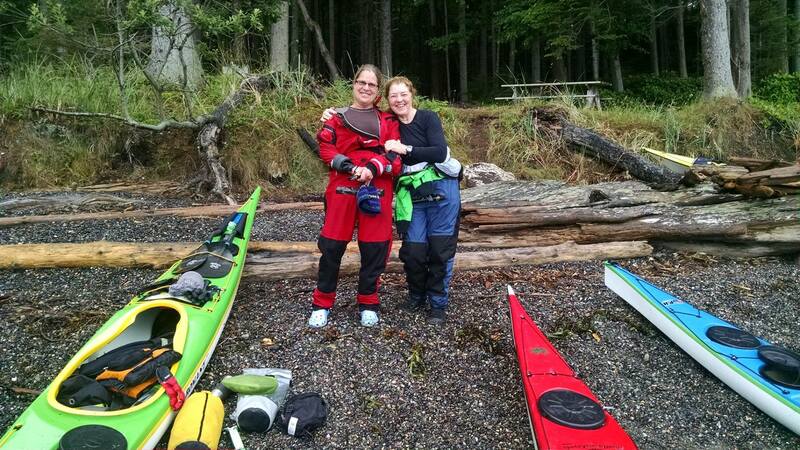 After spending some time recently in Sequim and Port Townsend, I realized I had never paddled Discovery Bay. This is a beautiful, protected body of water with few public places to launch boats - which means no boat traffic. 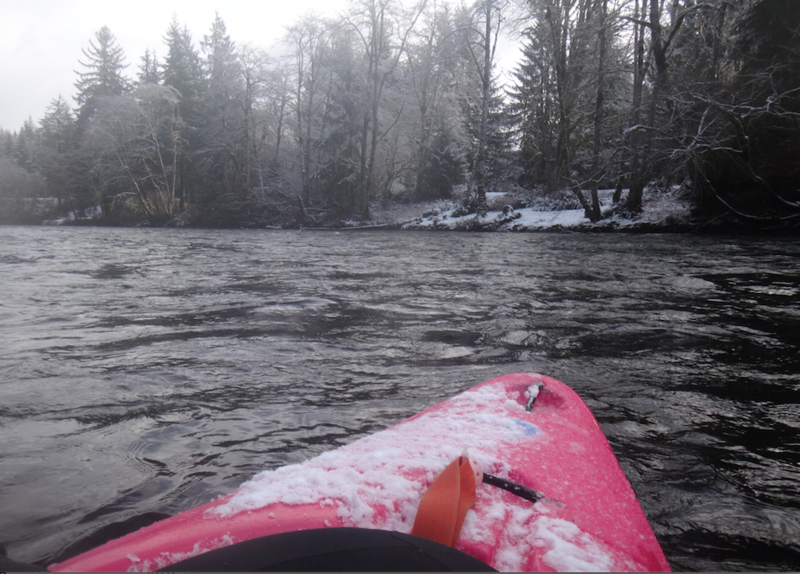 It is a perfect spot for a winter paddle. Very convenient to rent cabins at West Beach Resort which was our salt water launch spot for Saturday's trip along the west side of Orcas Island. Launching at 9:30 we paddled up to and around Pt. Doughty on our journey to Orcas Island International Airport. Magnificent views of Patos, Sucia, Matia and Clark islands and in the distance the Canadian islands with their snow peaked mountains. 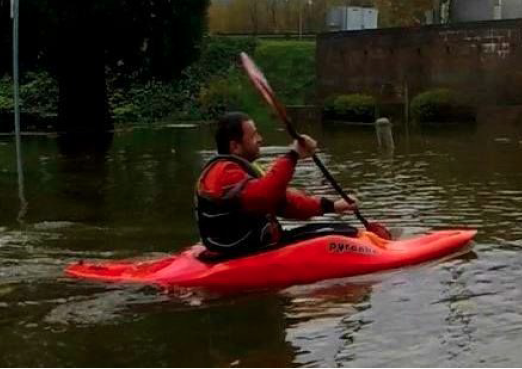 I am not a certified kayak instructor. As a graduate of the WKC Beginner Class in 2012, I don’t have a lot of experience, either. My paddle strokes, boat control, and river reading skills need improvement, and I flip a lot. But I have one skill that often wows my fellow boaters – my combat rolls. 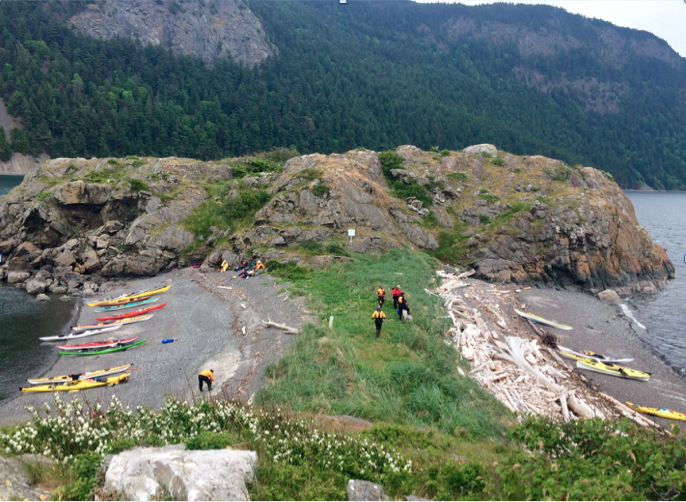 Five paddle pals and I explored the north end of Vancouver Island for seven days last August. 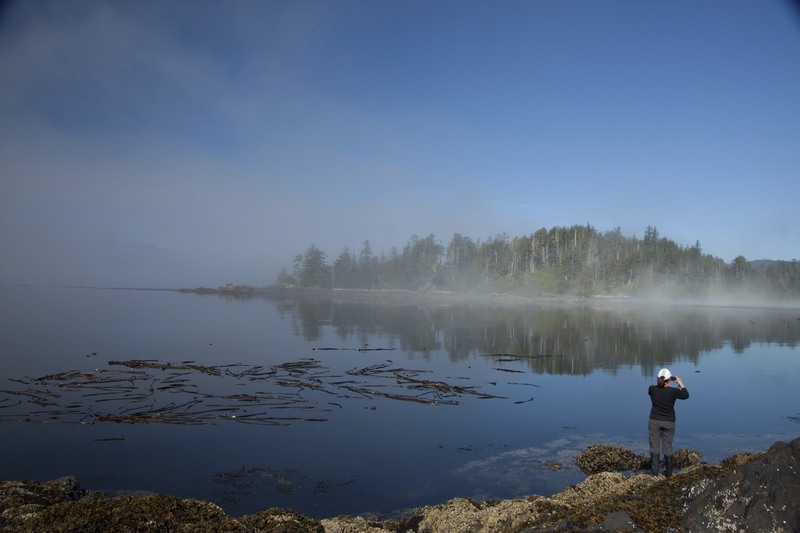 We traveled from Port Hardy to Cape Sutil and back while circumnavigating Nigei Island. This area is becoming a very popular place to paddle, and for good reason. It is easily accessible, the scenery is magnificent, and the paddling is fairly protected from the large swell of the outer coast. One must be prepared for windy and rainy conditions. Fortunately we did not encounter much wind or rain. Hopefully this trip report will help you plan your own excursion. 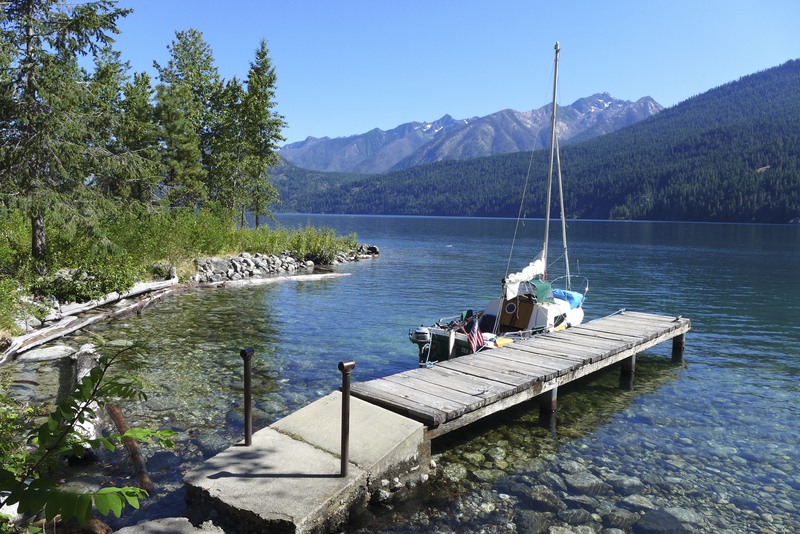 Lake Crescent is a deep, glacially created lake known for its brilliant blue, clear water. 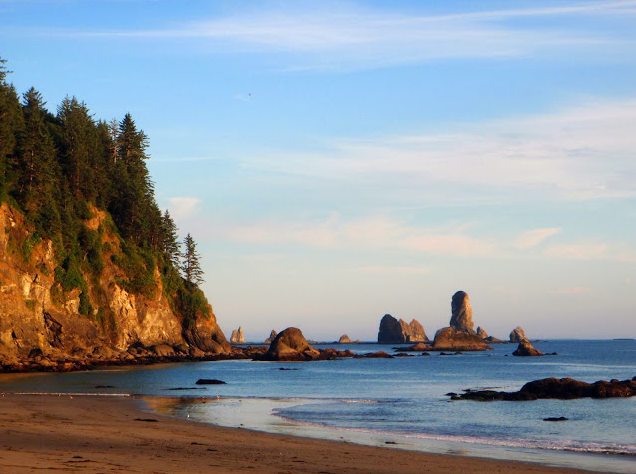 It is located in the Olympic National Park, approximately 17 miles west of Port Angeles. It is about a 2 1/2 to 3 hour drive from Seattle, including a scenic ride on the Bainbridge ferry. 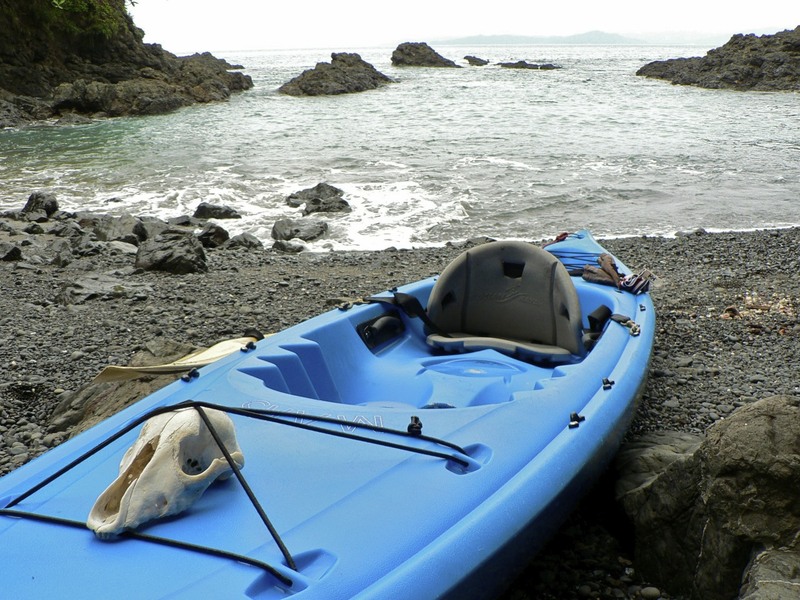 This is a great winter paddle to consider, when conditions at the coast become too rough. The winter birds have returned, the salmon have begun their migration upstream, and power boats are tethered and dry-docked for the winter. Grab your camera and binoculars and join us on the quieter side of the Salish Sea to enjoy nature’s bounty. Had a blast albeit a chilly blast on today's 'Anything but Shopping' paddle with great friends Julia, Tina, Zee, Rob, Mike, Mark and Jon. We had no trouble finding a parking place, there were no long lines in fact we had the whole beach to ourselves. Yes, it was a bit breezy, yes it rained hard the whole 3+ hours we where on the water, yes the hard rain did include occasional snow flakes. Yes, Mukilteo Mike, the resident sea lion and his harbor seal friends did seem to question our sanity but all had a great time................and we are thawed out now ! 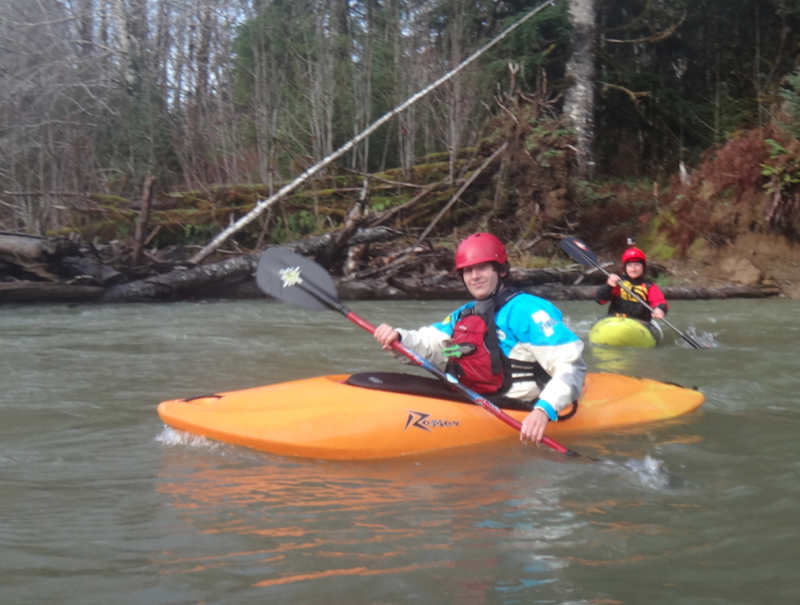 Paddled with a group of WKC (Washington Kayak Club) friends launching at the Quileute River Marina in La Push, WA. We paddled to Mosquito Cove some 11 miles to the south, which was our intended campsite. Fog... lots of sea fog in the mornings and fairly brisk winds in the 15-25k range in the afternoons for most of this trip. Highlight was loads of warm sunshine each and every day. A group of river folks that ran the Main Salmon last year together, had so much fun, that we did another river this year. 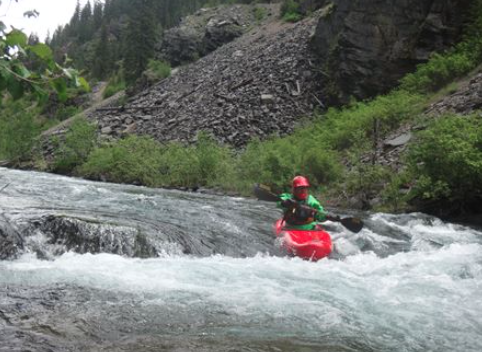 9 teens and 8 adults headed to the San Juan River in S. Utah about the middle of August. This article reveals little known exotic locations for epic kayaking yet to be developed or even much populated. By reading this information you promise to do your utmost to maintain their confidentiality... and get there someday soon. That being said, check this out. 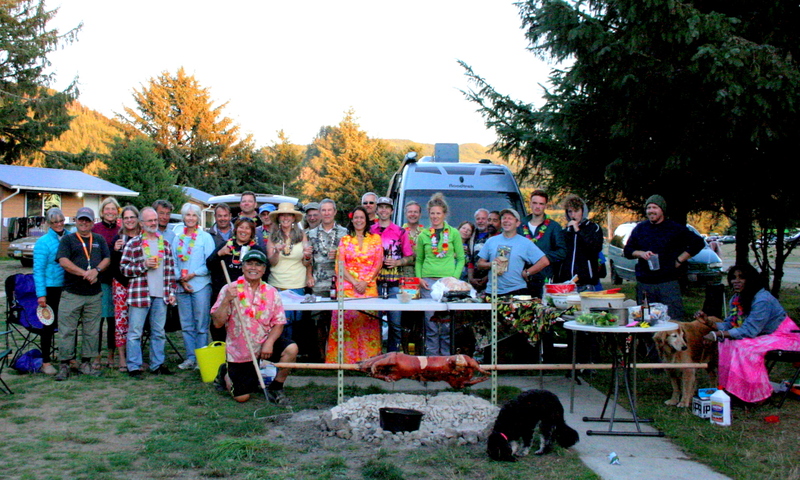 Two weeks ago on Sept 20 we had an epic event at Hobuck Beach in Neah Bay - the first club Luau and Beach party. Tomas Tabisola prepared an amazing Hawaiian feast including a roast pig. Ineze Arlene and Hilary Barnes helped prepare the side dishes for Tomas' menu. We declare them to be Knights of the WKC for their heroic efforts! At least 40 club members and guests attended and contributed potluck to the feast, music, and camaraderie. 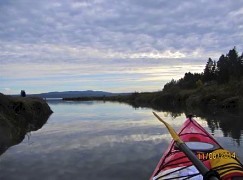 An October 3 Sea Kayaking trip around Cypress Island, with stops at Pelican Beach and a hike on the Eagle Cliff Trail to the summit lookout. 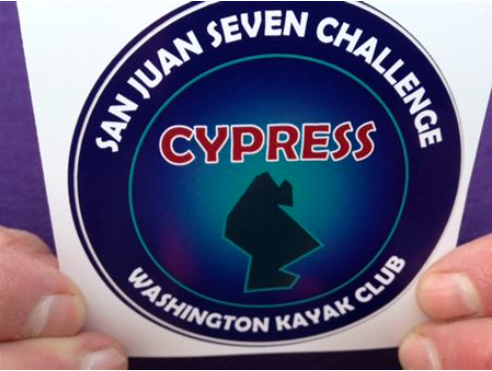 I first heard about Lumpy Waters last year when I won a certificate for Basic Skills Sea Kayak Class for Two at a Washington Waters Trail Association Auction Dinner. 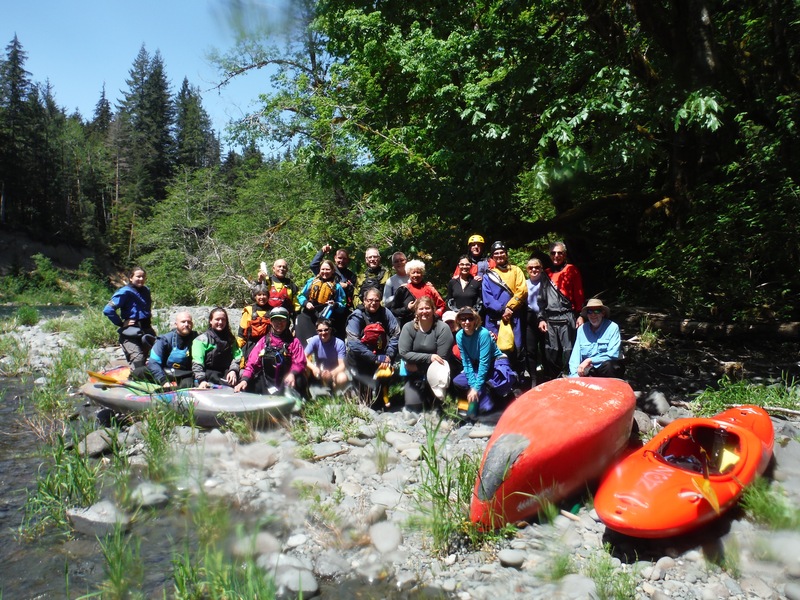 In googling Alder Creek to get its phone number, I saw a video and photos of the Fifth Annual Lumpy Waters Symposium on its website and it looked like everyone was having a great time. I knew immediately I wanted to be part of it. Starting our float at the park above Hwy 169 and under the bike trail(old railroad bridge), we floated about a mile to this obstruction. A high bank on river left gave way when the clay soil became supersaturated with water, and all the earth and trees came down and across the river. This section has been closed to the public since that time, but Sgt. Knauss of the King Co. Marine Division gave our WKC trip permission to go down through this area. We floated under the first trees, but had to get out and walk around trees that span the river just below here. 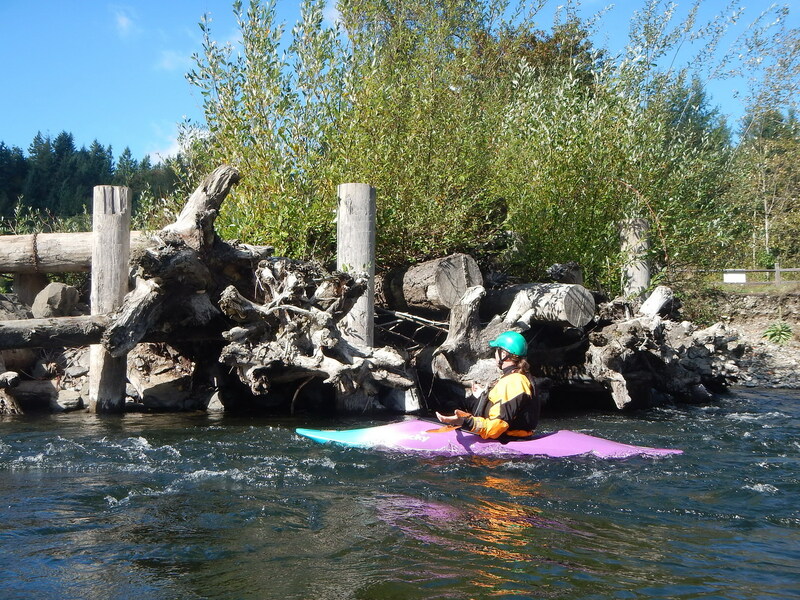 We launched on an ebbing tide and were able to paddle only about a half mile upstream on McAllister Creek before it became too shallow to paddle anymore. We saw our first bald eagle as it flew across the creek into the trees. It looked like it was carrying nesting material. Islands, warm air and water, sit-down restaurant half way through, lots of learning experiences - Steve Harris's Gulf Island trip was about as great as it gets. 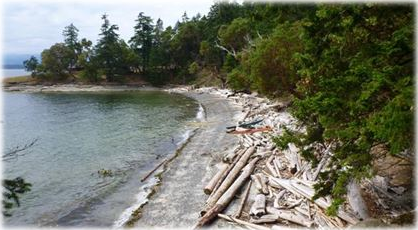 The route began at the north end of Salt Spring Island with a paddle to Chivers Point on Wallace Island. It continued through Porlier Pass to Sandstone Campground at Dionisio Point Park; then on to Blackberry Point and Pirate's Cove. 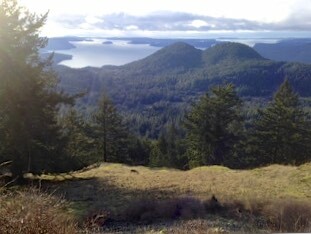 We also took a day trip through Gabriola Pass to Silva Bay for a touch of "civilization" before heading back home. 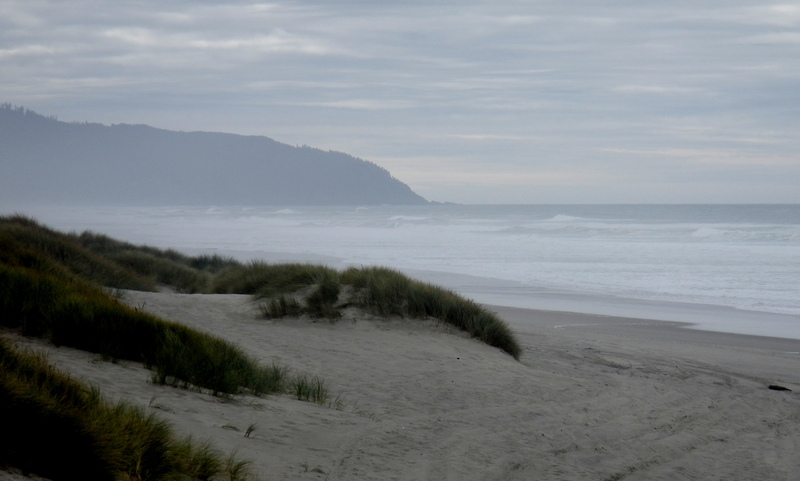 A couple years ago I visited Willapa Bay for the first time and was enchanted by its beauty. I kept a promise to myself to return with kayaks this April 11. The goal of the trip was to scout out kayak destinations and to try and observe birds during the spring migration. Three WKC paddlers joined me on a perfect weekend for the exploration. 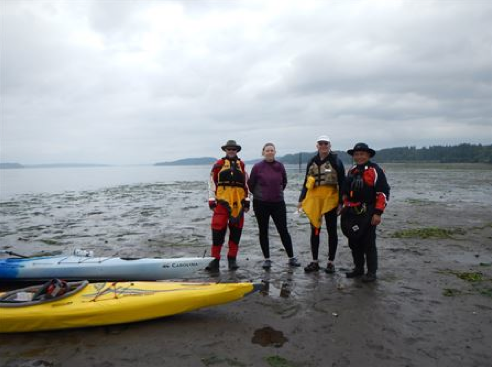 The float plan included a paddle up Smith Creek, a circumnavigation of Long Island, and a crossing of Willapa Bay to Leadbetter Point. 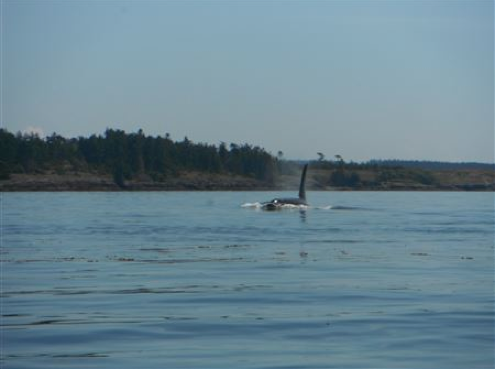 I’ll cut right to the chase: On Saturday we were surrounded by orcas. In addition, this trip was about islands, currents, wildlife, tide pools, flowers, beaches, peaceful solitude, and spam. Paddle pals along: Linday, Jonny, Judy &Scott (welcome, new members! ), Marty. On the rainy Sunday 5/4, Bill Petty, Doug Knapp, Chris Knorr and I went to run the Canyon Creek, a SF Stillaguamish tributary. The commonly known put-in for the 4-mile Class 2 section is next to the Masonic Park, but Bill took us to his put-in he made and maintains the path to. 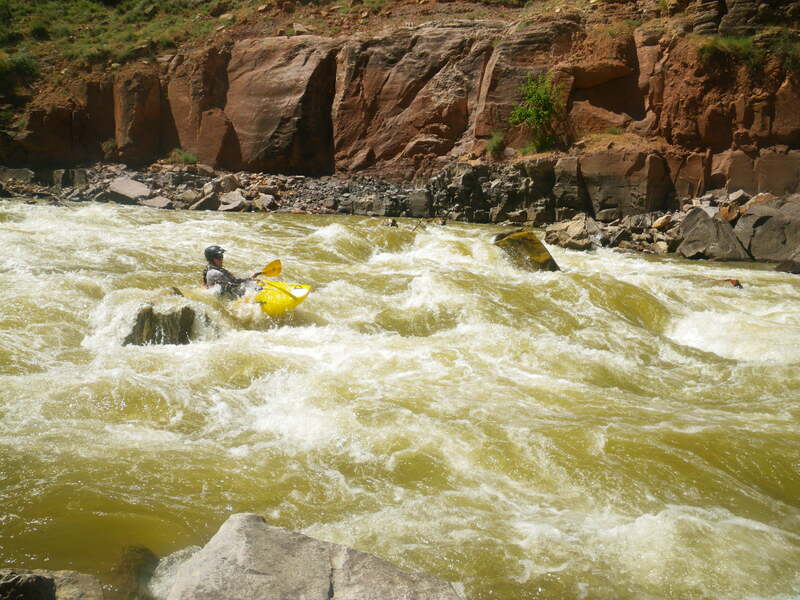 This adds another 4 miles and some Class 3-ish rapids. Just needed to hike a little. Actually, it was a bright and beautiful day in La Push with the marine forecast over the Labor Day weekend for the Washington coast of sunny, highs in the upper 60's, lows in the lower 50's, light to no wind, west swell 2 foot @ 16 seconds for Saturday and Sunday, changing Monday to west to southwest 5 foot @ 8 seconds.